Research on Calvary’s early history by Judith Sylte. All Photographs copyright 2004 by Judith Sylte. Below: view of the modern Calvary Chapel on King Street in Brynmawr. According to Calvary Baptist Church, Brynmawr: A Short History 1833-1933 by Edmund J. Williams, B.A. 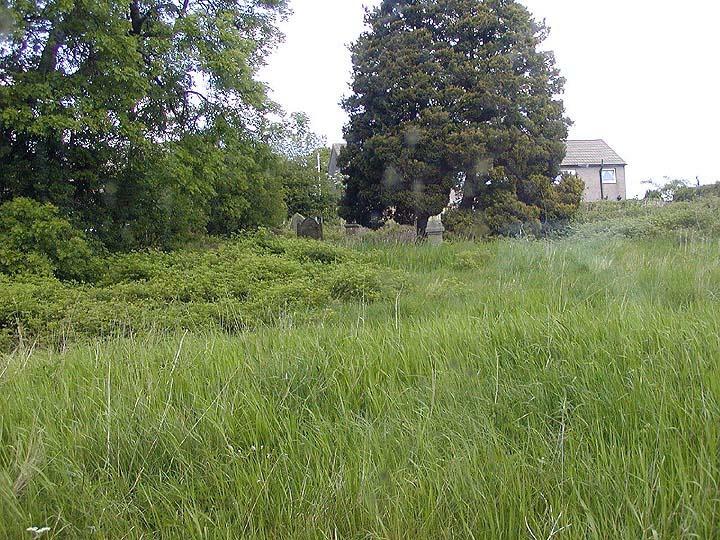 (Bendle & Son, Brynmawr & Tredegar, n.d.), Brynmawr's second oldest nonconformist congregation was born in response to the spiritual needs of English speakers who were moving into the area in increasing numbers as the region industrialized. "The English language had been making rapid inroads on the Welsh Church life of the neighbourhood, and although many were more conversant with English than with Welsh, facilities for English worship were missing. With the growth of industry, many from over the border came into the district, and their ignorance of the Welsh language made them the more eager to start a cause of their own. Seven had become members of Hermon Welsh Baptist Chapel, Nantyglo." This small group began holding cottage prayer meetings in Brynmawr, but participation soon grew enough to establish a permanent congregation. Its first formal meetings were held in September 1833 at the Old Post Office on Bailey Street in Brynmawr. Soon afterward, the small flock called Thomas Roberts from Llanwenarth (near Abergavenny), a shoemaker by trade and a Bible scholar by avocation, to be their first pastor. He was at first reluctant to come, but was at last persuaded. He was to remain at Calvary for 42 years, shepherding the congregation until his death in 1875. He was a tireless worker, much beloved and respected. A memorial plaque to him has long had a prominent place in the church sanctuary near the pulpit. "The earnest preaching and valuable work of Mr. Roberts led to loving friendship between honorary pastor and people; and the room at the Old Post Office was soon too small to accommodate the worshippers. The first members were the Pastor (Mr. Roberts), Mr. and Mrs. Thomas Powell, Mr. Daniel Rees, Mr. Ezekiel Jones, Mr. Edward Toger, and Mrs. Mary Rees." Below: two views of Calvary Chapel Sanctuary. At this time the Eagle Inn was under construction on King Street (the old Merthyr-Abergavenny turnpike), and the founding members of what was then often known simply as "the English chapel" persuaded the owner to enlarge an upstairs room there to accommodate them. This became the group's home for the next two years as the congregation steadily grew. 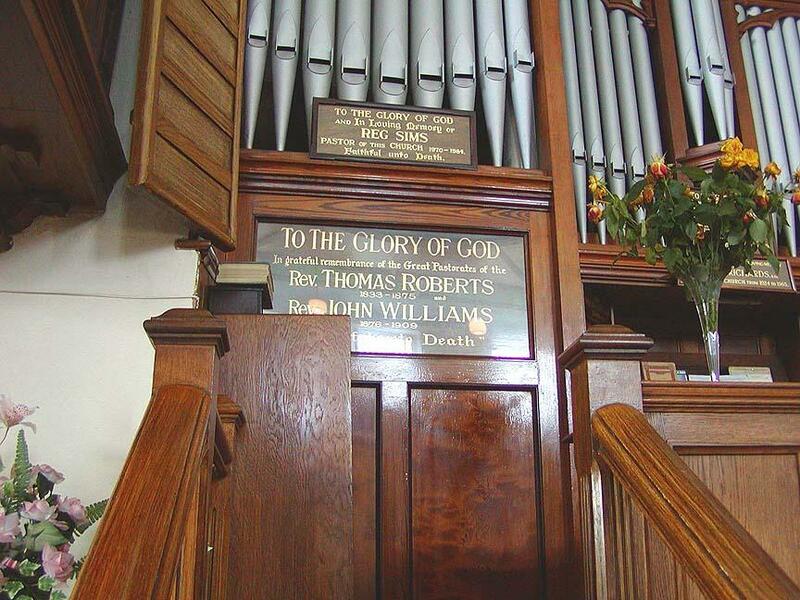 Other very early members mentioned in Williams' church history were John Allcock of Abersychan; John Watkins from America; Thomas Davies of the Rock, Hereford; David Phillips of Builth Wells; Mrs. Ann Roberts (the Pastor's wife) from Raglan; and David Evans, Thomas James, Mr. & Mrs. Bufton, and Mrs. Powles, all from Radnorshire. Future deacons Thomas Hope, Robert Gregory, John Judd and John Atherall were also active from the earliest years, though they did not formally join the church until later. In 1835 Mr. Roberts was formally ordained as a Christian minister, and later that year the first baptisms by immersion took place. For some years the site for these baptisms was the Old Feeder at Nantyglo (a.k.a. Waun Pond, between Nantyglo and Brynmawr), which had been built in 1820 to supply water to the ironworks. Williams relates the story of Mrs. James Powell's baptism there on a morning so bitterly cold the thick ice had to be broken first. A passing curate (presumably Anglican) stayed to watch out of curiosity and "was so impressed that he remarked how wonderfully strong must be the conviction of the candidate to submit to immersion under such climatic conditions." Below: dedication marker in the sanctuary commemorating the ministries of Revs. Roberts, Williams & Sims. Soon the meeting place at the Eagle was outgrown, so the congregation bought a parcel of land on King Street just across from the pub. The year 1836 was a prosperous one in Brynmawr's boom and bust cycle, so the building project found wide, enthusiastic support. By now the formal membership stood at 17, plus many additional non-members. On May 8th and 9th, 1837 the new chapel was dedicated in a service of thanksgiving which drew a large crowd, including visiting pastors from many miles distant. 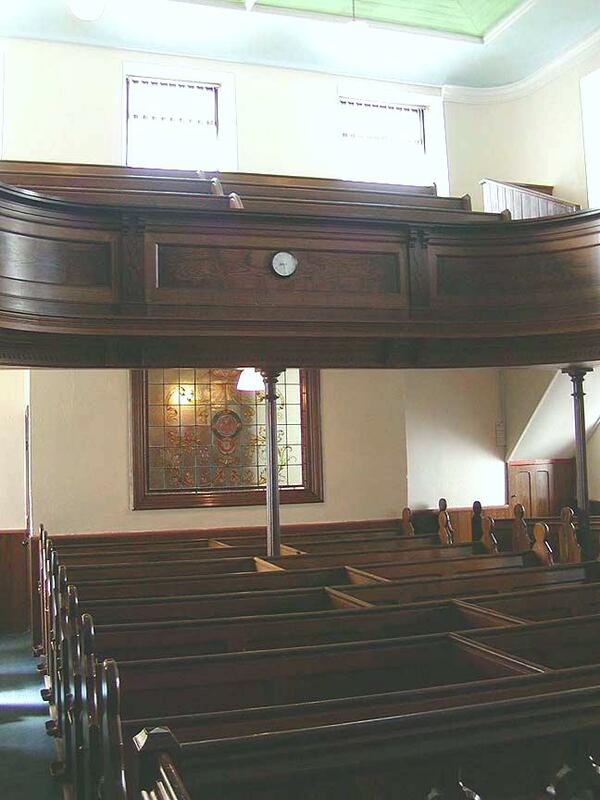 This King Street property has been the congregation's home ever since. Although the congregation had formed four years earlier, it is the 1837 dedication of the chapel that Calvary's written records refer to as the date of organization. The church's earliest surviving written records date from this same year. "...from other sources it is possible to note steady progress effected by the officers and members. Thomas Powell, the first deacon, treasurer and secretary, was a magnificent worker throughout the years; John Atherall, a gaffer at the patches and proprietor of a small coal level, was a man of many parts who did much service in connection with the cause; Ezekiel Jones, a tailor, and John Howells were also indefatigable." 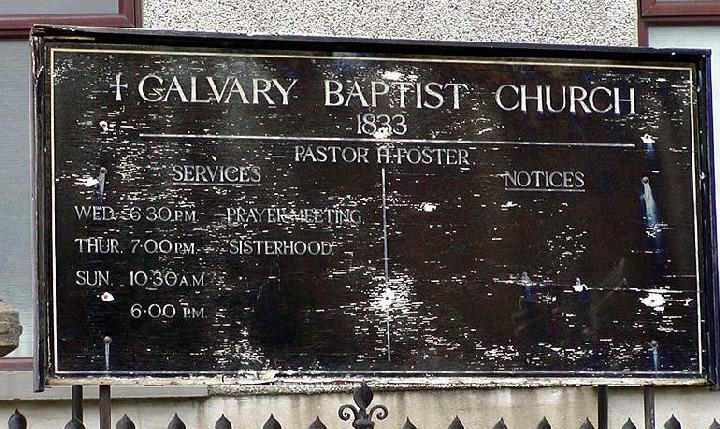 From 1840 and 1841, though, Calvary church baptisms, restorations, and memberships by various means all began to be methodically recorded in the Church Book ledger that survives today in the keeping of Pastor Howard Foster. Williams' history offers us just a glimpse of early worship at Calvary. Elsewhere in Britain, various nonconformist denominations viewed music (other than unaccompanied psalm singing) in the service with some suspicion, but that must have been a tough sell among the music-loving Welsh. Even in the early days at Calvary, making a joyful noise to the Lord was a vital feature of worship. "[John Howells] succeeded Mrs. Thomas Powell as the leader of the singing in 1840. Mr. Howells, as precentor, formed an orchestra to help the congregational singing. Evan Evans played the bass viol; W. Pritchard, the clarionet; James Powell, the violin; and T. Pearce, the flute…. The orchestra played an important part in the music of the sanctuary for many years." 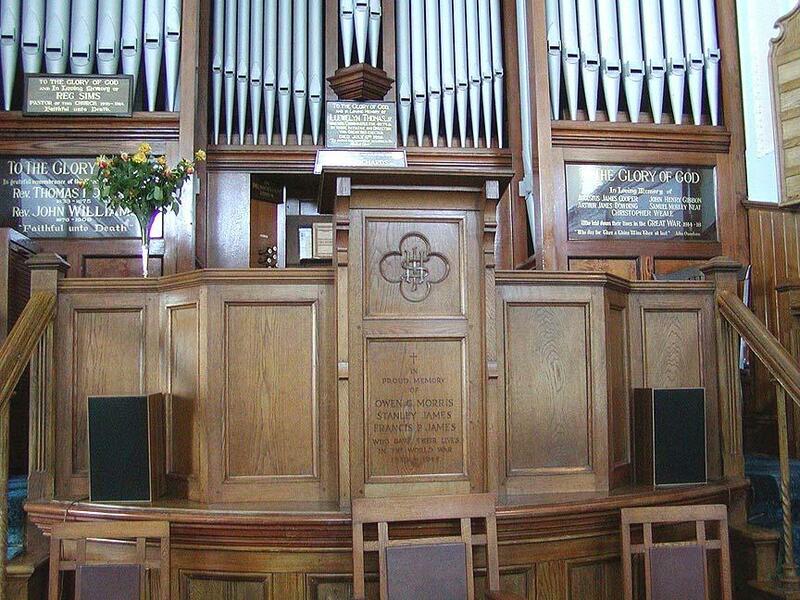 Eventually the orchestra gave way to an organ, ably played for years by David Abraham Davies. When the second precentor John Scamell left for America, Davies also assumed hymn-leading duties. Worship services were sometimes enlivened unintentionally. Williams notes that in the wintertime Daniel Rees, a Pembrokeshire native who was one of the founding members, wore a greatcoat with brass buttons so large and shiny that they were greatly admired by the children, whose attention was thus distracted from the sermons. The congregation continued to grow, and by the first membership roll recorded in the Church Book on October 3rd 1844, there were 131 official members and many other regular attendees. By this date, 271 individuals had already been listed in the ledger as having been members at some point. The fact that some no longer were probably reflects the mobile nature of the industrial workforce more than it does mortality or shifting allegiances. Some of what appears to be attrition is also almost surely the result of surname changes via marriage. In 1849 the great cholera epidemic ravaged South Wales, and the following year an article entitled "The Great Revival In South Wales" appeared in The Christian Witness (vii 1850, 315-6). 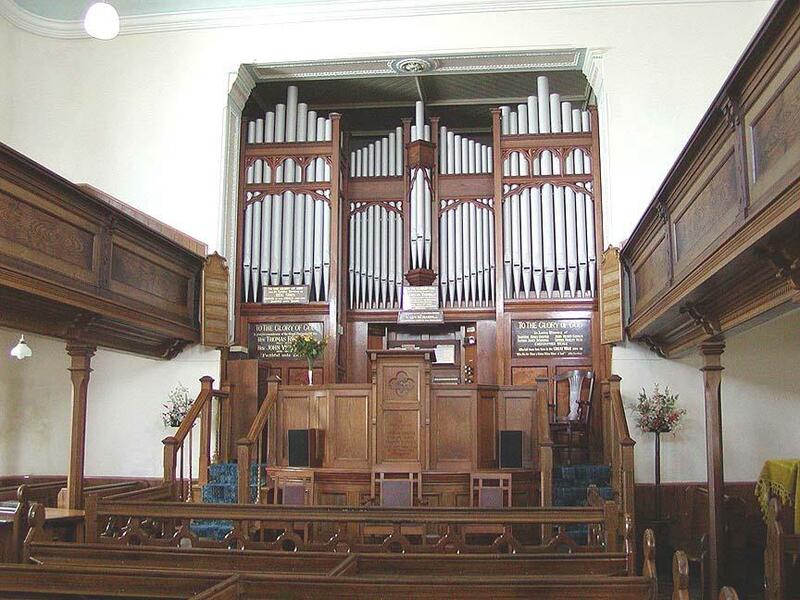 It relates how throughout the valleys, a great wave of spiritual fervor had swelled Congregational, Baptist and Methodist churches, including those in Brynmawr. By 1859 Calvary's formal membership stood at 193 and its regular attendance considerably higher. 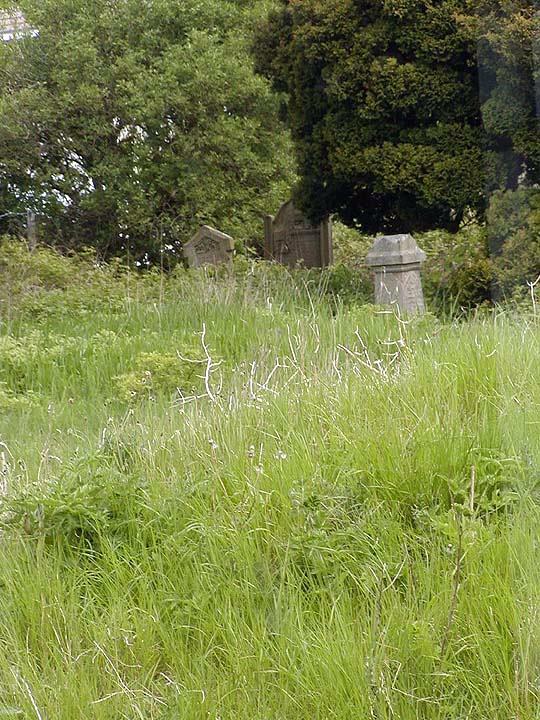 Below: two views of the overgrown cemetery adjacent to the church. I'm not sure when in Calvary's long history its membership peaked, or at what level, and I'll not attempt to record its later history here. In the sanctuary today, numerous wooden memorial plaques are a reminder of many who continued to dedicate themselves to the chapel's work over succeeding generations. In the family lore of many descendants of old Brynmawr folk, colorful memories of chapel members and events remain alive. There is no question that Calvary was a vital, central institution in the life of Brynmawr and surroundings for many, many decades. But times change, and since the great Welsh evangelical revivals of the 19th and early 20th centuries which lit flames around the world, Wales has become a vastly more secular nation. Today (summer 2004) Calvary has only 17 official members, many of them elderly. With one of Brynmawr's great pioneer chapels, nearby Rehoboth, having already fallen victim to time and the wrecking ball, the importance of preserving Calvary is greater than ever. Historical notes on Calvary Brynmawr, no matter how brief, cannot fail to mention one other fact. One of the great legacies of Wales' nonconformist chapels was the very high value they placed on personal education, both Biblical and secular. Chapel Sunday schools throughout Wales became a potent force in promoting not just basic literacy but more liberal scholarship among the working classes who had not had such opportunities before. In this dedication to education Calvary was no exception. 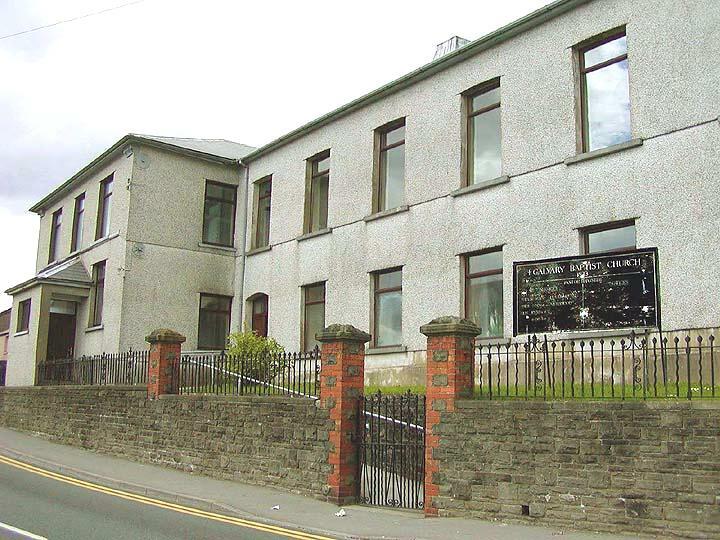 By the time Brynmawr's first school (the British School) was built by community donations in 1847, Calvary stood ready to join other local chapels in contributing generously. When that school was later threatened by debt, Calvary again stepped forward. This commitment to the betterment of ordinary men, women and children through education continued through succeeding decades, and when Brynmawr's first County School was finally built, Calvary members once again were leaders in the crusade. The reason for this steadfast support, even in times when money was scarce, is no mystery. The minds of the working class families who were the salt of the earth in the valleys of Wales, as they are everywhere, were a gift of God, and to waste the good Lord's blessings would be poor stewardship indeed. Any and all reminiscences of Calvary chapel and its members would be welcomed at any of a number of online sites dedicated to Brynmawr and its surrounding district. These include Jeff Thomas' website here at http://thomasgenweb.com/brynmawr.html; the Blaenau Gwent family history automated mail list, which is archived at http://archiver.rootsweb.com/th/index/BlaenauGwent/ or can be subscribed to by following the instructions at http://lists.rootsweb.com/index/intl/WLS/BlaenauGwent.html; and the Town Talk and/or Family Talk forums at Brynmawr Scene, http://www.brynmawrscene.co.uk/cgi-bin/yabb/YaBB.cgi. Help keep Calvary chapel's history alive and share it with others! Below: view over Brynmawr from Calvary Chapel. 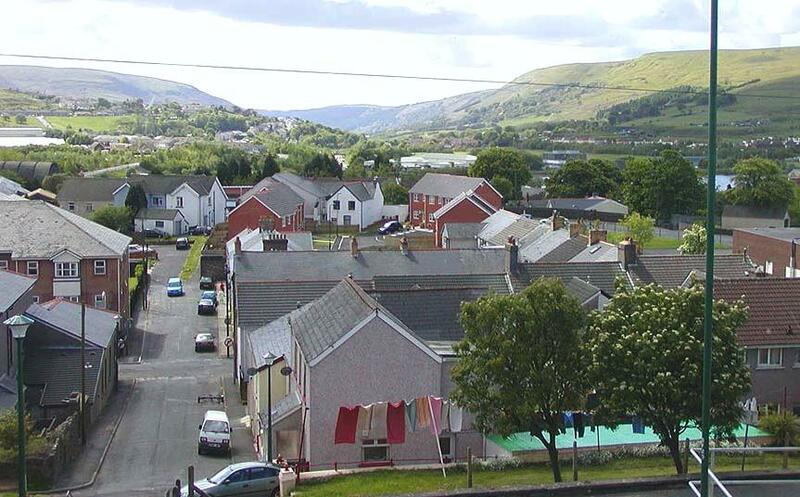 View photographs of Brynmawr & surrounds. Visit Brynmawr Scene: The official Brynmawr town web site.